As you may have heard, our friend Delia Brown was recently diagnosed with several rare and aggressive forms of uterine cancer. Unfortunately, Delia's new insurance, Blue Shield/Covered California, only covers 50% of outpatient treatments, and is not accepted by her doctors, including her oncologist (she had to pay out of pocket for her surgery). Delia will be undergoing 8 months of chemo & radiation beginning in 2 weeks, and will have cancer-related costs for the rest of her life, as these are unpredictable & frequently recurring cancers that require on-going management. The costs are extremely high but, here's the good news: We can ALL help! 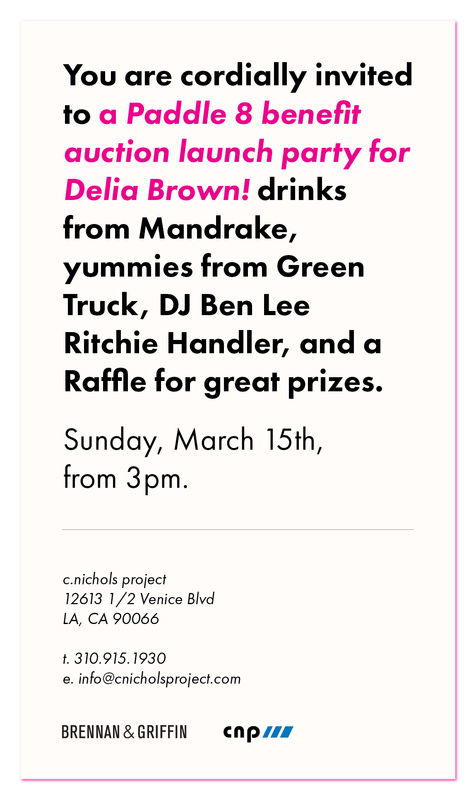 This very special Benefit Auction for Delia Brown invites all of her friends to help raise funds to cover the costs of her treatment through the donation of artworks. The aim is to draw on the strength, talent, and generosity of the arts community to help a dear friend of ours in her hour of need. Paddle8 will host an online auction of works starting on March 15th that will launch the benefit. Donated artworks will be exhibited and the auction will remain live on Paddle8 from 3 pm on that day until the end of March. All funds raised through the sale of artworks donated to this benefit will go directly towards assisting in covering Delia's substantial medical costs not covered by insurance. So we hope that you can all join us on Sunday, March 15th, beginning at 3pm!